ALL NATURAL, NEW & IMPROVED FORMULA – All natural homeopathic ingredients specifically selected and formulated to remove moles. These effective homeopathic ingredients are combined with essential oils for skin health. REMOVE MOLES NATURALLY – Safe, all-natural homeopathic product removes moles on your face or body. Also works on spots and other skin discolorations. Supports skin healing, health and circulation. SAFE AND GENTLE – Contains pure essential oils of French lavender and Frankincense along with skin nourishing avocado and grapeseed oil. Safe, homeopathic ingredients will not damage skin the skin. Do you have a mole that you just want gone? 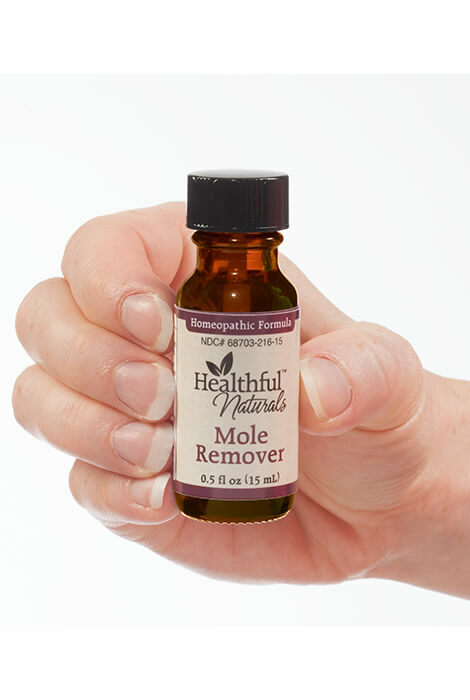 Healthful Naturals Mole Remover can help! 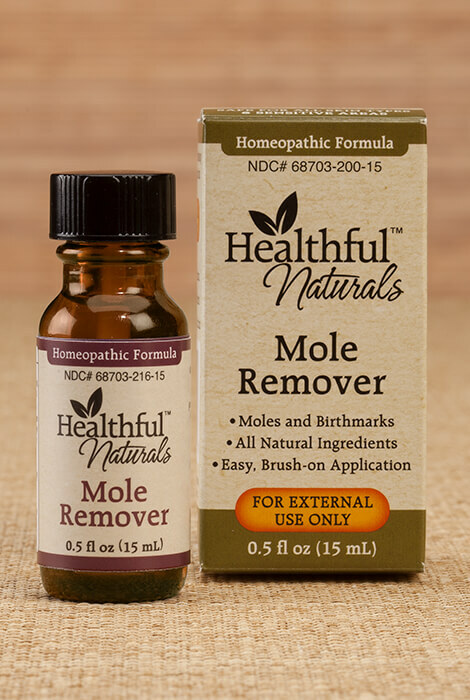 Specially formulated with all-natural homeopathic ingredients, Mole Remover can remove moles safely and effectively without scarring or the need to consult a doctor. 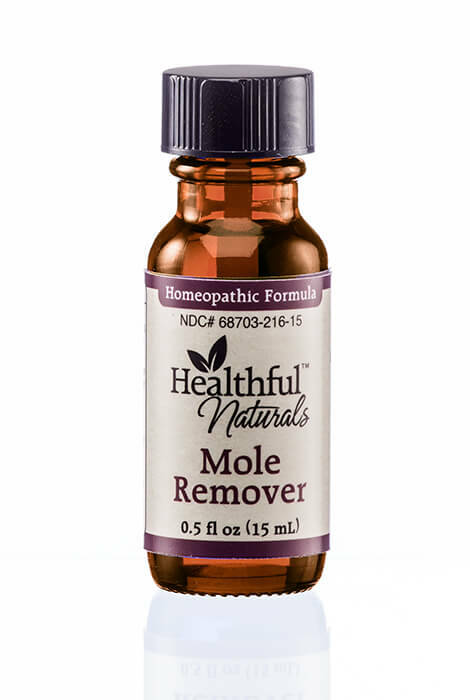 Mole Remover is a topical homeopathic remedy specifically formulated to remove moles. The effective, natural homeopathic ingredients are combined with essential oils for skin healing and health. Moles are growths on the skin which develop when the cells of the skin grow in a cluster, instead of spreading out. The cells in a mole are called melanocytes and can darken with age, sun exposure or during pregnancy. Although moles are harmless and benign (non-cancerous), if they change shape or color or begin to itch, bleed or ooze, consult your health care provider or dermatologist immediately. Mole Remover is a safe, gentle and natural way to relieve symptoms, help your body restore itself, and improve overall health. Non-toxic Healthful Naturals Mole Remover is the perfect solution for those who prefer natural healing methods and holistic approaches to wellness. Side-effect free and safe for adults and children 6+. While doctors and scientists are not really sure about what causes moles to develop in the first place, there are some indications that sun damage and heredity can play a role. While you can’t change your DNA, there are some risk factors for moles you can control. Be sensible about sun exposure. Too much of a good thing can cause skin damage. Treat your skin well with natural, nourishing oils such as coconut, avocado or rosehip. There is some thought that moles may be linked to a potassium deficiency. Include potassium rich foods in your diet. These include avocados, white beans, spinach, sweet potatoes and bananas. 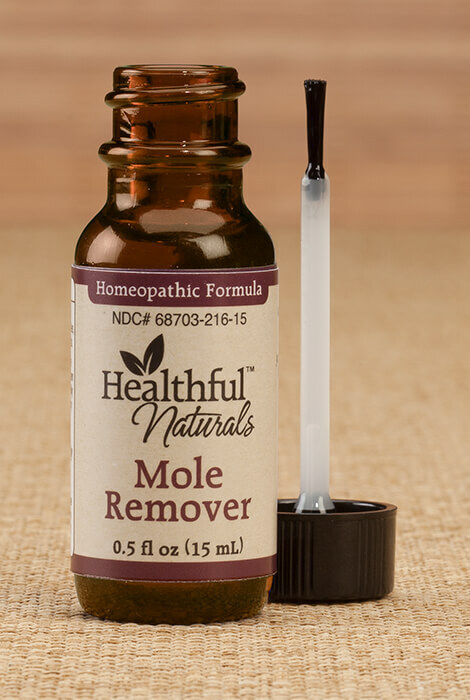 If you do develop a mole, that you just want gone, try Healthful Naturals Mole Remover. HPUS* Active Ingredients: Graphites 6C, Lycopodium clavatum 30C, Phosphorus 6C, Radium bromatum 30C, Sanguinaria canadensis 6C, Thuja occidentalis 30C. Inactive Ingredients: Avocado oil, Grapeseed oil, Lavender Essential Oil, Frankincense Essential Oil. *HPUS indicates the active ingredients are in the official Homeopathic Pharmacopoeia of the United States. Shake before using. Adults and Children over 6: Apply Healthful Naturals Mole Remover directly onto the mole, making sure the entire mole and surrounding area is covered completely. Repeat up to three times daily. Mole will dry and flake away over a period of 3-6 weeks. Caution: Healthful Naturals Mole Remover is not recommended for use during pregnancy. If you are pregnant or breastfeeding, ask a health professional before use. If symptoms persist or worsen, consult a health care professional. Keep this and all medications out of the reach of children. I only have used this for two weeks. Easy to apply with the brush applicator. Smells wonderful. I will tell anyone how great this product is !!!! For many years moles under the breasts bothered me. Now not self conscious anymore. Thanks healthy naturals. Trying it now. Update later.gave 5 star hope it measures up to that. I testify, that this product is effective. To remove the small black moles on my face and stop from growing larger. I am using this product to treat two brown age spots on my face. I love that there is no smell and it dries quickly. You don't even know it's there. The bottle said it could be used for brown spots and that they will flake off in a few weeks the same as a mole would. I have used the product only a short time. I do see a minimal affect of the mole/wart on my chest. I believe it will disappear over time. It takes very little fluid to apply. The smell of the product is unpleasant but quickly subsides. I gave it a 4 star rating because I have not used it in sufficient time to get the full result. Got it to get rid of moles. But it smells so bad when on, my husband thought I had really bad gas. Haven't used it since. The smell doesn't go away after awhile. I just tried to use it once and there was a terrible oder and I didn't know where it was coming from. The next day when I went to use it again I knew it was this. So unable to use it so don't know if it works or not. I used the product three times a day for a month or so. The moles did not disappear nor diminish in any capacity. Not too expensive to try. Never tried so taking a chance. I have ordered from you before and I like the products.